Hey! I’m Amy, and I’m in my first year studying Classics and English Lit at King’s College London. If you need any more of an introduction, you can find me over amyvnorris.com. I finally got around to reading The Fault in Our Stars and, honestly, I haven’t become quite as obsessed as everyone else has. It’s good, yes. It’s sad, yes. 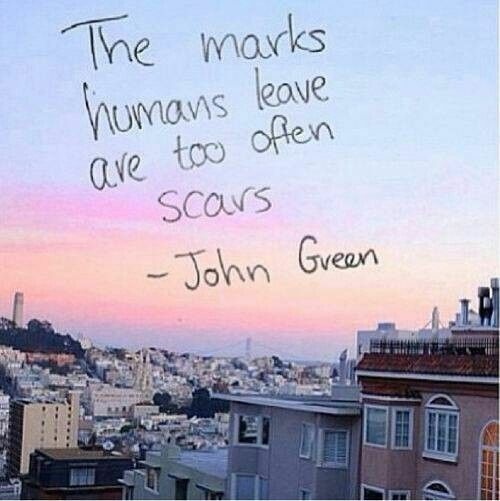 But the thing that really stuck with me is this quote – ‘the marks humans leave are too often scars’. I believe it’s so important to leave this world having made a mark. It doesn’t matter how big that mark is, but it’s important that you’ve changed something in some way. However, it’s even more important to make sure that that mark you leave is a positive one. There are so many opportunities we have as humans to affect the lives of others and each time we do this we are either enriching or worsening their experience on this Earth. We all know how an off-hand negative comment from someone whose opinion we don’t even care about can have a disproportionatly bad effect on your mood. Every time I go to express my opinion now, I take that millisecond extra to just consider my words. There are so many ways to make sure all of your actions leave a positive impact, and I’m trying to take those steps to make sure the marks I leave on this world aren’t scars.